This foaming salt scrub recipe is super easy to make and can be customized with your favorite scent! Just melt, pour and mix ingredients for a foaming salt scrub that gently exfoliates as it lathers and cleanses like soap! You will need to use a basic melt and pour soap base for my foaming salt scrub recipe. I specifically used the Crafter’s Choice basic white soap base. I can’t say that this will turn out the same using other soap bases, however, if you use an all natural soap base you’re likely to get a hard bar of soap rather than a salt scrub as the chemical composition of the soap bases is so different. Using a digital scale begin by weighing out the soap base. Cut into chunks using a Chef’s knife and heat in either a double boiler or in a large glass Pyrex measuring cup in 30 second increments, stirring in between heatings, until melted. Now weigh out the sal butter and melt. Stir the melted sal butter into the melted soap base. Follow with safflower oil and the fragrance oil. (I used a cayenne caramel fragrance oil for my foaming salt scrub recipe.) Weigh out the amounts needed and stir into the melted ingredients until thoroughly incorporated. Finally add your salts. Weigh out each of the salts and mix into the melted foaming salt scrub recipe ingredients until the mixture starts to solidify. Pour/scoop your foaming salt scrub into an 8 oz. plastic (BPA free) low profile jar and top with a sprinkle of pink Himalayan salt if desired. (Or fill individual favor jars for party or wedding favors.) Allow the foaming salt scrub to completely set up. It will appear solid but will give when you scoop it out or press your finger into it. Now screw on your lid and label or decorate your container to suit. (I decorated my container with a strip of Love Kitchen Translucent Washi Sticker Tape I purchased from Happy Zakka Life on Etsy. 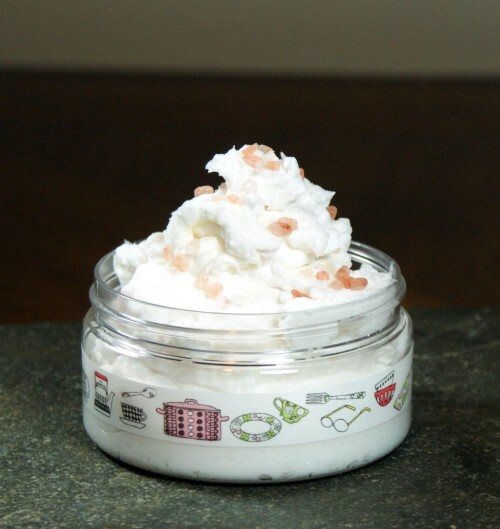 To use simply scoop out the desired amount and massage onto wet skin in the tub or shower. Your foaming salt scrub will have a light lather. Rinse off completely then pat dry. 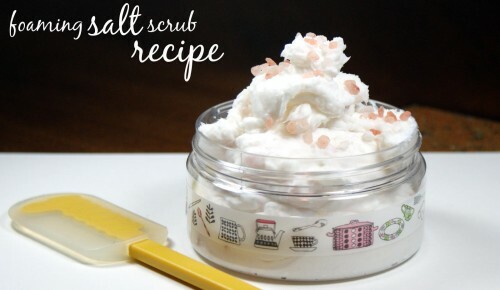 If you like my foaming salt scrub recipe then you may also like my ginger lime salt scrub recipe as well as my solid sugar scrub cubes recipe. Or, for even more easy skin care recipes, be sure to try out my collection of simple homemade skin care recipes for creating your own natural salve, homemade body butter and exfoliating sugar scrub. These three skin care recipes all share one ingredient in common and each have only two ingredients each! 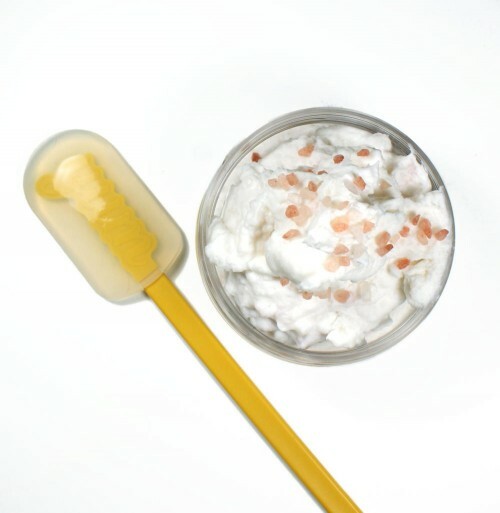 For even more homemade skin care recipes you can follow my DIY Bath and Body board on Pinterest. You can also find and follow me on Blog Lovin’, Tumblr, Facebook, Twitter, G+ and Instagram so you never miss a recipe.